Thompson Creek Window Company® specializes in replacement window installation. Window replacement can yield near-immediate improvements in comfort and energy efficiency. Furthermore, according to a Cost Vs. Value Report from Remodeling Magazine, replacement projects continue to perform better in resale value compared to other types of home improvements. How do you know when it’s time to replace a window? Cracked, broken or missing glass. These obvious issues can create safety hazards and contribute to higher utility bills. Drafts leaking in from the outside. This is a common issue with single pane windows, which do not provide good insulation from weather. Solar heat gain from not blocking out radiant heat. This can contribute to increased cooling costs in the summer and cause damage to home furnishings. Foggy or cloudy glass. This occurs when the seal between two panes of glass in a double-pane window has broken. Visible rot. Wood windows can rot over time and require ongoing maintenance. Water damage to walls or inside the home. Wood frames can weaken and rot, allowing water to seep into walls or into the home itself. Windows installed before 1978. These windows likely contain lead paint – a hazard for you and your family. With advancements in window design, engineering and manufacturing, today’s replacement windows are more durable and energy efficient than windows built even 10 years ago. Thompson Creek® windows are custom designed, built and installed just for your home. Our windows are locally built in the Washington, DC area using energy-efficient, long-lasting materials that withstand the test of time – and the Mid-Atlantic weather. 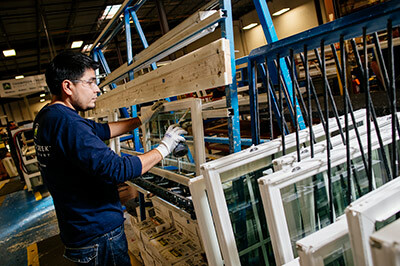 Each window built is custom-made for your home ensuring the highest quality and the best fit. We build our windows using the highest-grade vinyl materials and double or triple pane glass to provide protection from the extreme weather that occurs in our regional climate, such as hot, humid summers and cold winters. Strong and durable. Our windows are AAMA-tested to stand strong in the face of dramatic wind (153 miles per hour). Energy efficient. Our windows exceed the 2017 ENERGY STAR® criteria. Secure. Pocket sills are built into every frame to ensure greater home security. Safe. Tilt-in sashes make cleaning safe and easy. Once your windows are built to the exact specifications to your home, they are transferred to our warehouse and ready to meet your installation date. Explore Thompson Creek’s® many window options, take a virtual tour of our windows showroom or visit a showroom to see them in person.